Not to be confused with sodium nitrate, sodium nitride, or nitratine. "E250" redirects here. For the mobile phone, see Samsung SGH-E250. Sodium nitrite is an inorganic compound with the chemical formula NaNO2. It is a white to slightly yellowish crystalline powder that is very soluble in water and is hygroscopic. It is a useful precursor to a variety of organic compounds, such as pharmaceuticals, dyes, and pesticides, but it is probably best known as a food additive used in processed meats and (in some countries) in fish products. Unit cell of sodium nitrite under standard conditions. Nitrate or nitrite (ingested) under conditions that result in endogenous nitrosation has been classified as "probably carcinogenic to humans" by International Agency for Research on Cancer (IARC). Nitrite is an easy way to give a pink shade to processed meats. Nitrite reacts with the meat myoglobin to cause color changes, first converting to nitrosomyoglobin (bright red), then, on heating, to nitrosohemochrome (a pink pigment). According to the meat industry, nitrite is used to prevent botulism. Yet several large meat processors produce safe processed meats without relying on nitrite or nitrate. The main use of sodium nitrite is for the industrial production of organonitrogen compounds. It is a reagent for conversion of amines into diazo compounds, which are key precursors to many dyes, such as diazo dyes. Nitroso compounds are produced from nitrites. These are used in the rubber industry. It is used in a variety of metallurgical applications, for phosphatizing and detinning. Sodium nitrite is an effective corrosion inhibitor and is used as an additive in industrial greases, as an aqueous solution in closed loop cooling systems, and in a molten state as a heat transfer medium. Sodium nitrite is on the World Health Organization's List of Essential Medicines as it is an efficient drug in case of cyanide poisoning. It is used together with sodium thiosulfate. Historically, salt has been used for the preservation of meat. The salt-preserved meatproduct was usually brownish-gray in color. When sodium nitrite is added with the salt, the meat develops a red, then pink color, which is associated with cured meats such as ham, bacon, hot dogs, and bologna. In the early 1900s, irregular curing was commonplace. This led to further research surrounding the use of sodium nitrite as an additive in food, standardizing the amount present in foods to minimize the amount needed while maximizing its food additive role. Through this research, sodium nitrite has been found to give taste and color to the meat; inhibit lipid oxidation that leads to rancidity; and inhibit growth of disease-causing microorganisms. The ability of sodium nitrite to address the above-mentioned issues has led to production of meat with extended storage life and has improved desirable color/taste. According to scientists working for the meat industry, nitrite has improved food safety. Nitrite has the E number E250. Potassium nitrite (E249) is used in the same way. It is approved for usage in the EU, USA and Australia and New Zealand. The appearance and taste of meat is an important component of consumer acceptance. Sodium nitrite is responsible for the desirable red color (or shaded pink) of meat. Very little nitrite is needed to induce this change. It has been reported that as little as 2 to 14 parts per million (ppm) is needed to induce this desirable color change. However, to extend the lifespan of this color change, significantly higher levels are needed. The mechanism responsible for this color change is the formation of nitrosylating agents by nitrite, which has the ability to transfer nitric oxide that subsequently reacts with myoglobin to produce the cured meat color. The unique taste associated with cured meat is also affected by the addition of sodium nitrite. However, the mechanism underlying this change in taste is still not fully understood. Sodium nitrite is known for its role in inhibiting the growth of Clostridium botulinum spores in refrigerated meats. The mechanism for this activity results from the inhibition of iron-sulfur clusters essential to energy metabolism of Clostridium botulinum. However, sodium nitrite has had varying degrees of effectiveness for controlling growth of other spoilage or disease causing microorganisms. Even though the inhibitory mechanisms for sodium nitrite are not well known, its effectiveness depends on several factors including residual nitrite level, pH, salt concentration, reductants present and iron content. Furthermore, the type of bacteria also affects sodium nitrites effectiveness. It is generally agreed upon that sodium nitrite is not considered effective for controlling gram-negative enteric pathogens such as Salmonella and Escherichia coli. Other food additives (such as lactate and sorbate) provide similar protection against bacteria, but do not provide the desired pink color. Sodium nitrite is also able to effectively delay the development of oxidative rancidity. Lipid oxidation is considered to be a major reason for the deterioration of quality of meat products (rancidity and unappetizing flavors). Sodium nitrite acts as an antioxidant in a mechanism similar to the one responsible for the coloring affect. Nitrite reacts with heme proteins and metal ions, neutralizing free radicals by nitric oxide (one of its byproducts). Neutralization of these free radicals terminates the cycle of lipid oxidation that leads to rancidity. While this chemical will prevent the growth of bacteria, it can be toxic in high amounts for animals and humans. Sodium nitrite's LD50 in rats is 180 mg/kg and its human LDLo is 71 mg/kg, meaning a 65 kg person would likely have to consume at least 4.6 g to result in death. To prevent toxicity, sodium nitrite (blended with salt) sold as a food additive is dyed bright pink to avoid mistaking it for plain salt or sugar. Nitrites are not naturally occurring in vegetables in significant quantities. However, nitrates are found in commercially available vegetables and a study in an intensive agricultural area in northern Portugal found residual nitrate levels in 34 vegetable samples, including different varieties of cabbage, lettuce, spinach, parsley and turnips ranged between 54 and 2440 mg/kg, e.g. curly kale (302.0 mg/kg) and green cauliflower (64 mg/kg). Boiling vegetables lowers nitrate but not nitrite. Fresh meat contains 0.4–0.5 mg/kg nitrite and 4–7 mg/kg of nitrate (10–30 mg/kg nitrate in cured meats). The presence of nitrite in animal tissue is a consequence of metabolism of nitric oxide, an important neurotransmitter. Nitric oxide can be created de novo from nitric oxide synthase utilizing arginine or from ingested nitrate or nitrite. Because of sodium nitrite's high level of toxicity to swine (Sus scrofa) it is now being developed in Australia to control feral pigs and wild boar. The sodium nitrite induces methemoglobinemia in swine, i.e. it reduces the amount of oxygen that is released from hemoglobin, so the animal will feel faint and pass out, and then die in a humane manner after first being rendered unconscious. The Texas Parks and Wildlife Department operates a research facility at Kerr Wildlife Management Area, where they examine feral pig feeding preferences and bait tactics to administer sodium nitrite. Carcinogenicity is the ability or tendency of a chemical to induce tumors , increase their incidence or malignancy, or shorten the time of tumor occurrence. A principal concern about sodium nitrite is the formation of carcinogenic nitrosamines in meats containing sodium nitrite when meat is cooked. Such carcinogenic nitrosamines can also be formed from the reaction of nitrite with secondary amines under acidic conditions (such as occurs in the human stomach) as well as during the curing process used to preserve meats. Dietary sources of nitrosamines include US cured meats preserved with sodium nitrite as well as the dried salted fish eaten in Japan. In the 1920s, a significant change in US meat curing practices resulted in a 69% decrease in average nitrite content. This event preceded the beginning of a dramatic decline in gastric cancer mortality. Around 1970, it was found that ascorbic acid (vitamin C), an antioxidant, inhibits nitrosamine formation. Consequently, the addition of at least 550 ppm of ascorbic acid is required in meats manufactured in the United States. Manufacturers sometimes instead use erythorbic acid, a cheaper but equally effective isomer of ascorbic acid. Additionally, manufacturers may include α-tocopherol (vitamin E) to further inhibit nitrosamine production. α-Tocopherol, ascorbic acid, and erythorbic acid all inhibit nitrosamine production by their oxidation-reduction properties. Ascorbic acid, for example, forms dehydroascorbic acid when oxidized, which when in the presence of nitrosonium, a potent nitrosating agent formed from sodium nitrite, reduces the nitrosonium into nitric oxide. The nitrosonium ion formed in acidic nitrite solutions is commonly mislabeled nitrous anhydride, an unstable nitrogen oxide that cannot exist in vitro. Sodium nitrite consumption has also been linked to the triggering of migraines in individuals who already suffer from them. One study has found a correlation between highly frequent ingestion of meats cured with pink salt and the COPD form of lung disease. The study's researchers suggest that the high amount of nitrites in the meats was responsible; however, the team did not prove the nitrite theory. Additionally, the study does not prove that nitrites or cured meat caused higher rates of COPD, merely a link. The researchers did adjust for many of COPD's risk factors, but they commented they cannot rule out all possible unmeasurable causes or risks for COPD. Carcinogenic nitrosamines are formed when amines that occur naturally in food react with sodium nitrite found in cured meat products. In the presence of acid (such as in the stomach) or heat (such as via cooking), nitrosamines are converted to diazonium ions. Certain nitrosamines such as N-nitrosodimethylamine and N-nitrosopyrrolidine form carbocations that react with biological nucleophiles (such as DNA or an enzyme) in the cell. If this nucleophilic substitution reaction occurs at a crucial site in a biomolecule, it can disrupt normal cell functions, leading to cancer or cell death. Industrial production of sodium nitrite follows one of two processes, the reduction of nitrate salts, or the oxidation of lower nitrogen oxides. One method uses molten sodium nitrate as the salt, and lead which is oxidized, while a more modern method uses scrap iron filings to reduce the nitrate. A more commonly used method involves the general reaction of nitrogen oxides in alkaline aqueous solution, with the addition of a catalyst. The exact conditions depend on which nitrogen oxides are used, and what the oxidant is, as the conditions need to be carefully controlled to avoid over oxidation of the nitrogen atom. 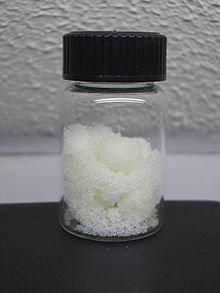 Sodium nitrite has also been produced by reduction of nitrate salts by exposure to heat, light, ionizing radiation, metals, hydrogen, and electrolytic reduction. In the laboratory, sodium nitrite can be used to destroy excess sodium azide. Above 330 °C sodium nitrite decomposes (in air) to sodium oxide, nitric oxide and nitrogen dioxide. In organic synthesis isotope enriched sodium nitrite-15N can be used instead of normal sodium nitrite as their reactivity is nearly identical in most reactions. The obtained products carry isotope 15N and hence Nitrogen NMR can be efficiently carried out. ^ T. Gohda; M. Ichikawa (November 1996). "The Refinement of the Structure of Ferroelectric Sodium Nitrite". Journal of the Korean Physical Society. 29: 551–554. ^ Zumdahl, Steven S. (2009). Chemical Principles (6th ed.). Houghton Mifflin Company. p. A23. ISBN 978-0-618-94690-7. ^ Lerfall, Jørgen; Østerlie, Marianne (1 February 2011). "Use of sodium nitrite in salt-curing of Atlantic salmon (Salmo salar L.) – Impact on product quality". Food Chemistry. 124 (3): 759–766. doi:10.1016/j.foodchem.2010.06.092. ISSN 0308-8146. ^ a b "List of classifications, Volumes 1–116 - IARC Monographs on the Evaluation of Carcinogenic Risks to Humans". International Agency for Research on Cancer (IARC) - World Health Organization (WHO). 2010. Retrieved 25 September 2016. ^ a b "VOLUME 94 - Ingested Nitrate and Nitrite, and Cyanobacterial Peptide Toxins - IARC Monographs on the Evaluation of Carcinogenic Risks to Humans". International Agency for Research on Cancer (IARC) - World Health Organization (WHO). 2010. Retrieved 25 September 2016. ^ Bailey, M. E.; Frame, R. W.; Naumann, H. D. (1 January 1964). "Cured Meat Pigments, Studies of the Photooxidation of Nitrosomyoglobin". Journal of Agricultural and Food Chemistry. 12 (1): 89–93. doi:10.1021/jf60131a026. ISSN 0021-8561. ^ "Consorzio del Prosciutto di Parma". www.prosciuttodiparma.com. Retrieved 28 January 2019. ^ Wilson, Bee (1 March 2018). "Yes, bacon really is killing us". The Guardian. ISSN 0261-3077. Retrieved 28 January 2019. ^ Krakhmalev, S. I.; Vorotnikova, V. A.; Ten, N. V.; Taranova, N. V. (1984). "Determination of sodium nitrite in complex sodium grease". Chemistry and Technology of Fuels and Oils. 20 (12): 612–613. doi:10.1007/BF00726438. ^ "Sodium Nitrite". General Chemical. Retrieved 28 September 2012. ^ "WHO Model List of EssentialMedicines" (PDF). World Health Organization. April 2015. Retrieved 25 September 2016. ^ "Sodium Nitrite - an overview | ScienceDirect Topics". www.sciencedirect.com. Retrieved 28 January 2019. ^ WHO Model Formulary 2008 (PDF). World Health Organization. 2009. pp. 65–66. ISBN 9789241547659. Retrieved 8 January 2017. ^ ""Meat Pigment Chemistry", taken from IFT Mini-Experiments in Food Science Series" (PDF). ^ a b c d e f g h Sindelar, Jeffrey; Milkowski, Andrew (March 2012). "Human safety controversies surrounding nitrate and nitrite in the diet". Nitric Oxide. 26 (4): 259–266. doi:10.1016/j.niox.2012.03.011. PMID 22487433. ^ "Science Says: Are hot dogs healthier without added nitrites? | Lifestyle from CTV News". www.ctvnews.ca. Retrieved 28 January 2019. ^ UK Food Standards Agency: "Current EU approved additives and their E Numbers". Retrieved 27 October 2011. ^ "Health and Food Safety" (PDF). European Commission - European Commission. Retrieved 1 April 2018. ^ US Food and Drug Administration: "Listing of Food Additives Status Part II". Retrieved 27 October 2011. ^ Australia New Zealand Food Standards Code "Standard 1.2.4 – Labelling of ingredients". Retrieved 27 October 2011. ^ a b c d e f g h i j k l Sindelar, Jeffrey; Milkowski, Andrew (November 2011). "Sodium Nitrite in Processed Meat and Poultry Meats: A Review of Curing and Examining the Risk/Benefit of Its Use" (PDF). American Meat Science Association. 3: 1–14. ^ a b Milkowski, Andrew; Garg, Harsha; Couglin, James; Bryan, Nathan (January 2010). "Nutritional epidemiology in the context of nitric oxide biology: Risk-Benefit evaluation for dietary nitrite and nitrate". Nitric Oxide. 22 (2): 110–119. doi:10.1016/j.niox.2009.08.004. PMID 19748594. ^ Seward, R A; Deibel, R H; Lindsay, R C (1982). "Effects of potassium sorbate and other antibotulinal agents on germination and outgrowth of Clostridium botulinum type E spores in microcultures". Applied and Environmental Microbiology. 44 (5): 1212–1221. ISSN 0099-2240. PMC 242170. PMID 6758699. ^ Paquette, M. W.; Robach, M. C.; Allen, C. E.; Bhothipaksa, K.; Busta, F. F.; Sofos, J. N. (1 September 1980). "EFFECTS OF VARIOUS CONCENTRATIONS OF SODIUM NITRITE AND POTASSIUM SORBATE ON Clostridium botulinum TOXIN PRODUCTION IN COMMERCIALLY PREPARED BACON". Journal of Food Science. 45 (5): 1285–1292. doi:10.1111/j.1365-2621.1980.tb06539.x. ISSN 1750-3841. ^ a b Dennis, M. J.; Wilson, L. A. (2003). "Nitrates and Nitrites". Encyclopedia of Food Sciences and Nutrition. p. 4136. doi:10.1016/B0-12-227055-X/00830-0. ISBN 978-0-12-227055-0. ^ a b Leszczyńska, Teresa; Filipiak-Florkiewicz, Agnieszka; Cieślik, Ewa; Sikora, ElżBieta; Pisulewski, Paweł M. (2009). "Effects of some processing methods on nitrate and nitrite changes in cruciferous vegetables". Journal of Food Composition and Analysis. 22 (4): 315–321. doi:10.1016/j.jfca.2008.10.025. ^ Correia, Manuela; Barroso, Ângela; Barroso, M. Fátima; Soares, Débora; Oliveira, M. B. P. P.; Delerue-Matos, Cristina (2010). "Contribution of different vegetable types to exogenous nitrate and nitrite exposure". Food Chemistry. 120 (4): 960–966. doi:10.1016/j.foodchem.2009.11.030. hdl:10400.22/3054. ^ Meulemans, A.; Delsenne, F. (1994). "Measurement of nitrite and nitrate levels in biological samples by capillary electrophoresis". Journal of Chromatography B. 660 (2): 401–404. doi:10.1016/0378-4347(94)00310-6. ^ Southan, G; Srinivasan, A (1998). "Nitrogen Oxides and Hydroxyguanidines: Formation of Donors of Nitric and Nitrous Oxides and Possible Relevance to Nitrous Oxide Formation by Nitric Oxide Synthase". Nitric Oxide. 2 (4): 270–86. doi:10.1006/niox.1998.0187. PMID 9851368. ^ Lapidge, Steven; Wishart, J.; Smith, M.; Staples, L. (2009). "Is America Ready for a Humane Feral Pig Toxicant?". Proceedings of the 13th Wildlife Damage Management Conference: 49–59. ^ Cowled, B. D.; Lapidge, S. J.; Humphrys, S.; Staples, L. (2008). "Nitrite Salts as Poisons in Baits for Omnivores". International Patent WO/2008/104028. ^ Porter, S.; Kuchel, T. (2010). Assessing the humaness and efficacy of a new feral pig bait in domestic pigs. Study PC0409 (PDF). Canberra, South Australia: Veterinary Services Division, Institute of Medical and Veterinary Science. p. 11. ^ Texas Parks and Wildlife (21 February 2013). "Hogs Wild - Fighting the Feral Pig Problem - Texas Parks and Wildlife [Official]". Retrieved 1 April 2018 – via YouTube. ^ "Known and Probable Human Carcinogens". www.cancer.org. Retrieved 28 January 2019. ^ "Carcinogenicity - an overview | ScienceDirect Topics". www.sciencedirect.com. Retrieved 28 January 2019. ^ Freeman, Harold P.; Oropeza, Ruben; Saborio, David V.; Paik, David C. (2000). "The epidemiological enigma of gastric cancer rates in the US: was grandmother's sausage the cause?". International Journal of Epidemiology. 30 (1): 181–182. doi:10.1093/ije/30.1.181. ^ Mackerness, C. W.; Leach, S. A.; Thompson, M. H.; Hill, M. J. (1989). "The inhibition of bacterially mediated N-nitrosation by vitamin C: relevance to the inhibition of endogenous N-nitrosation in the achlorhydric stomach". Carcinogenesis. 10 (2): 397–9. doi:10.1093/carcin/10.2.397. PMID 2492212. ^ "Research Newsletter". Linus Pauling Institute. 1 July 2014. Retrieved 1 April 2018. ^ Scanlan, R. A. (May 1983). "Formation and occurrence of nitrosamines in food". Cancer Res. 43 (5 Suppl): 2435s–2440s. PMID 6831466. ^ Nollet, Toldra, D (2015). Handbook of Food Analysis (Third ed.). p. 290. ISBN 9781482297843. ^ Williams, D (2004). "Reagents effecting nitrosation". Nitrosation Reactions and the Chemistry of Nitric Oxide. p. 1. doi:10.1016/B978-044451721-0/50002-5. ISBN 978-0-444-51721-0. ^ "Heading Off Migraine Pain". FDA Consumer magazine. U.S. Food and Drug Administration. 1998. ^ Hitti, Miranda (17 April 2007). "Study: Cured Meats, COPD May Be Linked". WebMD Medical News. ^ Jiang, R.; Paik, D. C.; Hankinson, J. L.; Barr, R. G. (2007). "Cured Meat Consumption, Lung Function, and Chronic Obstructive Pulmonary Disease among United States Adults". American Journal of Respiratory and Critical Care Medicine. 175 (8): 798–804. doi:10.1164/rccm.200607-969OC. PMC 1899290. PMID 17255565. ^ Najm, Issam; Trussell, R. Rhodes (February 2001). "NDMA Formation in Water and Wastewater". Journal AWWA. 93 (2): 92–99. doi:10.1002/j.1551-8833.2001.tb09129.x. ^ Bills, Donald D.; Hildrum, Kjell I.; Scanlan, Richard A.; Libbey, Leonard M. (May 1973). "Potential precursors of N-nitrosopyrrolidine in bacon and other fried foods". J. Agric. Food Chem. 21 (5): 876–7. doi:10.1021/jf60189a029. PMID 4739004. ^ Hao, Zhi-wei; Xu, Xin-hua; Wang, Da-hui (March 2005). "Reductive denitrification of nitrate by scrap iron filings". Journal of Zhejiang University SCIENCE. 6B (3): 182–186. doi:10.1631/jzus.2005.B0182. PMC 1389719. PMID 15682502. ^ Pokorny L et al; "Sodium Nitrate and Nitrite" in "Kirk-Othmer Encyclopedia of Chemical Technology", 2005, NY, NY: John Wiley & Sons. ^ "Sodium Azide". Hazardous Waste Management. Northeastern University. March 2003. Archived from the original on 4 November 2007. ^ National Research Council (1995). Prudent practices in the laboratory: handling and disposal of chemicals. Washington, D.C.: National Academy Press. doi:10.17226/4911. ISBN 978-0-309-05229-0. ^ Stern, Kurt H. (1972). 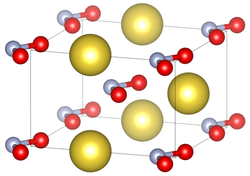 "High Temperature Properties and Decomposition of Inorganic Salts; Part 3. Nitrates and Nitrites" (PDF). J. Phys. Chem. 1 (3): 750–751. Bibcode:1972JPCRD...1..747S. doi:10.1063/1.3253104. Retrieved 15 March 2014. ^ Kazem-Rostami, Masoud; Akhmedov, Novruz G.; Faramarzi, Sadegh (2019). "Using NaNO2 for 15N isotope labelling of azo compounds". Journal of Molecular Structure. 1178: 538–543. doi:10.1016/j.molstruc.2018.10.071.